If you're looking for a full-body workout, swimming may be the answer, especially if you're looking to lose weight. Swimming offers a low-impact aerobic workout that allows you to get your heart rate up without putting pressure on your joints, making it a great workout for those who are overweight or in whom weight-bearing exercise is contraindicated. In addition, swimming targets the muscles in your legs, abdomen, shoulders and arms, enabling you to build up muscle strength and tone. Competitive swimming races feature four strokes, including the freestyle, breaststroke, butterfly and backstroke. In all strokes except the backstroke, swimmers face the bottom of the pool. The freestyle features a scissor kick while you pull your arms through the water in an alternating rhythm. In the breaststroke, you pull both arms through the water at the same time while performing a frog kick. The butterfly combines a dolphin kick with an overhead arm pull, and the backstroke combines a scissor kick with alternating arm strokes. Lap swimming works muscles in the abdominals, biceps and triceps, gluteals, hamstrings and quadriceps, according to The Stretching Institute website. Different strokes emphasize different muscle groups. The freestyle emphasizes the deltoids and leg muscles; the breaststroke emphasizes the thighs, biceps and gluteal muscles; the butterfly emphasizes the abdominals, deltoids and leg muscles; and the backstroke emphasizes the triceps and leg muscles. A 160-lb. 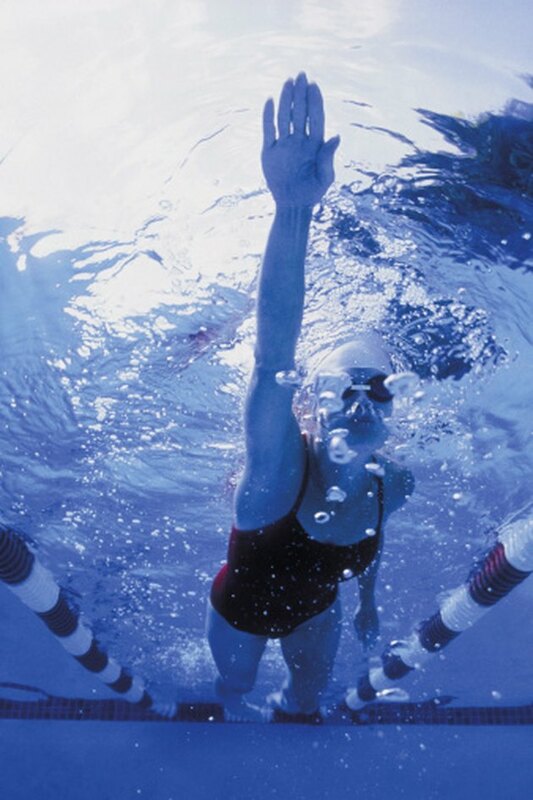 adult can burn 511 calories in one hour of swimming laps, according to MayoClinic.com. A 200-lb. adult can burn 637 calories with the same workout, and a 240-lb. adult can burn 763 calories. The more you weigh, the more calories you will burn. The more intense your effort and the longer your workout, the more calories you will burn, as well. Swimming laps provides a moderate to intense aerobic workout that can strengthen your muscles and increase your lung capacity. Regular physical activity can also help you minimize your risk of heart disease, diabetes, metabolic disorders and some cancers, according to the Centers for Disease Control and Prevention. Regular exercise can also improve your mood and help you to sleep more deeply. Consult your doctor before you start a strenuous swimming program. Protect your muscles by warming up for at least five minutes and stretching before your swimming workouts. Avoid swimming laps without a lifeguard present. Use caution when swimming in open water where undercurrents, riptides or hazardous creatures may be present. Avoid swimming in cold water, and never swim after consuming alcoholic beverages. Guardian.co.uk: Are You Swimming Right?